SSR Mining Inc. (SSRM) was down 1.1% to $10.75 per share on the Nasdaq Thursday to a market capitalization of $1.29 billion. But I expect some upside in the share price will occur over the next days, following the news that SSR Mining has inked an agreement with the owner of the high-grade Las Chispas mineral project SilverCrest Metals Inc. (SILV)(SIL.V) for the purchase of 8,220,645 newly issued ordinary shares of SilverCrest at a price of C$3.73 or about $2.80 per share. Warning! GuruFocus has detected 4 Warning Sign with SSRM. Click here to check it out. SSR Mining will acquire about 9.9% of total issued and outstanding common stock of SilverCrest, by way of private placement for a total payment of C$30.66 million or approximately $23 million. The closing is expected to take place around Dec. 7. The Las Chispas project comprising an area of approximately 1,389 hectares located in the favorable mining jurisdiction of the Mexican State of Sonora represents the main property of SilverCrest Metals. The owner of the Las Chispas development project is also active in exploration of precious metals properties that it acquires. The Canadian explorer has estimated that the Las Chispas property hosts mineral inferred resources for approximately 86.7 million ounces of equivalent silver or about 511,500 ounces of gold and 48.3 million ounces of silver. The mineral property is also characterized by a high concentration of precious metal in the ore. Silver averages 347 grams per ton and gold averages 3.68 grams per ton of mineral. However, shareholders of SSR Mining need to know that inferred resources are not proven and probable mineral reserves. SilverCrest Metals will engage in further drillings with the intention to move the category of inferred resources up to that of measured resources first and to that of proven and probable reserves in a later stage, but there is no guarantee that that will happen. However, for the first quarter of 2019, SilverCrest has targeted the release of resource recategorization in addition to a preliminary economic assessment of the project. So, we will see what the report says. Paul Benson, the president and CEO of SSR Mining, said that Las Chispas development project represents a compelling investment proposition for the company and that they are very interested in building a strong relationship with SilverCrest as the explorer has already demonstrated in the past that it can discover profitable mineral deposits. But what makes the investment interesting for shareholders of SSR Mining is not SilverCrest Metals' successful track record of mineral discoveries and the Las Chispas project, but the outstanding performance of SilverCrest on the stock market. 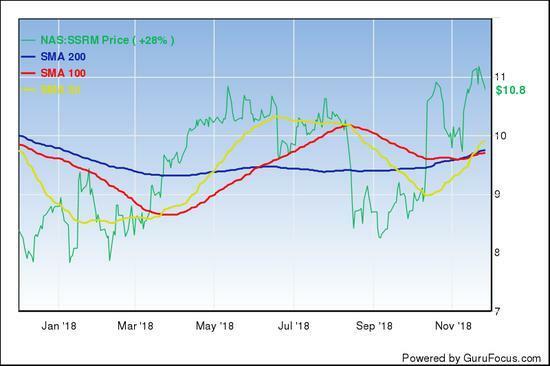 In fact, for the 52 weeks through Nov. 29, the share price of SilverCrest showed stamina compared to the Van Eck Vectors Gold Miners ETF (GDX) and to SSR Mining when the precious metal down trended. The chart of GuruFocus illustrates this. SSR Mining increased 28%, Van Eck Vectors Gold Miners ETF decreased 15% and SilverCrest increased more than 125%. The Van Eck Vectors Gold Miners ETF is usually used by investors as a benchmark for the whole gold mining stocks industry. Over the same period, gold decreased 4.8% to an average of $1,221.11 per ounce and silver declined 15.5% to an average of $14.3731 per ounce on the London Bullion Market. Looking ahead, the analyst predicts that SilverCrest Metals will appreciate nearly 15% on the TSX Venture Exchange from the share price at close Thursday within the next 52 weeks. Conditions are right for SSR Mining to get the value of its total cash on hand and securities item increasing more. The agreement between SSR Mining and SilverCrest Metals bears a catalyst. Does this catalyst justify a buying approach on SSR Mining? Yes, but I would not enact it now that the share price is abundantly over the 200-, 100- and 50-day simple moving average lines. The share price at close Thursday was also nearly 41% above the 52-week low of $7.64 and 6.4% from the 52-week high of $11.44. The stock is not cheap even though the price-book ratio is 1.34 versus an industry median of 1.74 and the EV-Ebitda ratio is 7.24 versus an industry median of 9.3. I would start adding SSR Mining after a significant weakness in the share price. I don't think that this will materialize any time soon considering that the agreement with SilverCrest Metals will trigger some stock appreciation. Hopes are for any meaningful weakness in the share price of SSR Mining to happen before the Federal Reserve issues another hike in the interest rate. The U.S. Central Bank's move, which is expected for mid-December, should create some pressure on the precious metal with increasing effects on its price. The market value of SSR Mining on the Nasdaq will follow the commodity. SSR Mining does not distribute dividends. The stock has a recommendation rating of 2.3 out of 5 and an average target price of $11.75.